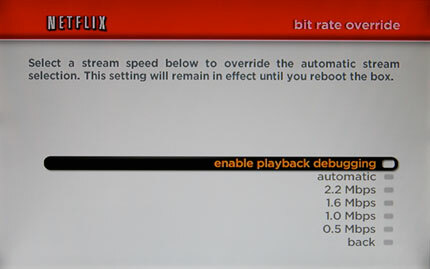 Hacking NetFlix : Speed Problems with Roku's Netflix Player? Speed Problems with Roku's Netflix Player? Tip from the Roku forum: How to get into debug mode on your Neflix Player: "To enter debug mode, all keypresses about 1/2 second a part. Hit HOME 5 times, Rew 3 times, FF 2 times. You should then be in debug mode. It may take a couple tries to get it." Are you having problems with your Netflix Player? I get anywhere from 1 to 3 dots - 2 dots most of the time. My issue is I've been getting lots of re-buffering lately (like 4 or 5 times per title). Occasionally re-buffering times out and the Roku just spontaneously reboots (which is especially irritating). Could it have something to do with Starz? The flakiness seemed to start about the same time the Starz movies became available. "...getting lots of re-buffering lately (like 4 or 5 times per title). Occasionally re-buffering times out and the Roku just spontaneously reboots..."
I've experienced the same issues lately. Was unable to watch any episodes of the Office a couple of nights ago. Really damn annoying! If I set it to automatic I usually get 3-4 dots (I have 3mbps down from DSL), except for some reason Starz movies show at 2 dots. If I set it to 4 dots default (via the hack), then I generally don't have any problems (no rebuffering or anything). My box is currently set to default to 4-dots. I've had nothing but 4-dot quality on my Roku NFPlayer (Denver area, Comcast ISP) since June 10th. It didn't matter day or night, weekday or weekend. It rocked solid. That changed sometime during the week of Oct 27-31st. Now its 2-dot with an occasional 3-dot. I'm not a happy camper about this. I use my RokuNFP to mostly watch 30min, 60min TV show episodes, averaging probably no more than 3 hours weekly. There's a ton of chatter on the Roku forums but little explanation/response from Roku tech's themselves because "they're busy with the HD streams rollout." There's lots of room for finger pointing on this (Roku, ISP, NF) but the one fact remains as fact - whatever the problem/issue/IPfiltering is going on this is seriously effecting a large customer base and its not just a fluke or localized issue. I have the LG Network Blu-Ray Player, is there a hack to get to the settings for their Netflix Streaming? The software appears to be the same as Roku.. I can't find information on that anywhere. Thanks! It changes with the wind. Last weekend I got nothing but 1 dot all weekend which was unwatchable. Now I'm getting 4 dots every single time. There doesn't seem to be any explanation, but the Roku forums are trying hard to figure it out. I'm in the Spokane, Washington, area, and have had the same experience of many others. Sometime in October, we suddenly went from 4 dots to 2 for most movies and TV shows. Every now and then a 1-dot, which is unwatchable. The re-buffering is not as bad it was at first, as we can at least get through a TV show or movie with one or none. But the quality never improves to 4 dots. And the problem is not my broadband connection. If more and more people are using Netflix, then I can assume the problem will be getting worse, to a point where it's not even an option in our house and we just rely on DVDs in the mail again. Too bad, really, because I see streaming video as the future of home entertainment. Is there any chance that most of thos experiencing problem are using Comcast as ISP? The rnadomness makes it seem like some kind of ISP throttling. I've seen mention of this elsewhere. I should've mentioned... I'm on Time Warner, and we have absolutely no problem with high-quality streaming video from Hulu, NBC, Fox, Sci-Fi, or any of the other networks that are offering their shows to the Internet. I have Verizon and I rarely see 2 dots or less (except for Starz movies), but again, I just set mine to default to 4 dots and don't have to worry. I also have the 1 star problem. and have always had 4 star performance until Nov 1 that I started noticing this. Also my Hulu is coincidentally getting choppy but its still watchable. I tried watching through the web browser but the buffer times are longer than the movies there too. Im in New Mexico with Comcast and thought it was comcast's bandwidth throttling that they put in place in October. Some rumors point at how Comcast filters data streams like Bit Torrent and how the Netflix Watch now may be throttled. Comcast says everything looks good with the connect with the modem to comcast and there is no packet loss and ping times look good. While Netflix says that my ping speeds are super slow and that it is a problem with my ISP. I just want my Roku to work like it did a couple weeks ago. I had the 1-star problem last night for the first time ever. That hack doesn't work very well. Whenever I set the speed to anything other than 'automatic', even if I choose a lower speed than usual, the box buffers for about 15 minutes before playing the movie. According to the Roku site there is only 64 MB on board the box available for buffering, so the problem must be on the server side. The box was damn cheap, but I would have paid more for one that buffers at least 20 minutes of video, which is what my home computer does when I stream Netflix. I bought the Roku one about two weeks ago and I'm usually on one star, sometimes 2. I never had 3 or 4 stars. I'm in San Francisco, DSL by At&T. The debug mode works, but the load time is heavy. I have the LG BD300 as well and am curious as well about how to access the debug mode on that player? Anybody know? I'm in Seattle on Qwest getting ~3Mbps DSL. I have never experienced 4 dots but usually 3. Now in Oct/Nov getting 2 consistently. Now I get rebuffering too. Something has changed outside of my network. I use the roku nearly every night anywhere around 7pm - 1am. The ping times to moviecontrol.netflix.com come in at 52ms avg though - which seems pretty good to me. I only have 1.5Mbps DSL which is usually good enought for 2-dot viewing. On Tuesday my wife and I watched the Roku for the first time in a couple weeks, and I noticed a LOT more rebuffering and 1-dot time than is usual. Taking that together with other comments posted here, I have to think that the problem is not throttling by individual ISPs. Either there is a capacity problem at the Netflix server farm or their upstream connection to the Internet backbone. At least, that would be my guess. I'm on Time Warner in NYC - I get 4 dots every single time, even wirelessly through a wall. Was it ever determined whether this was a Roku issue or an ISP issue? To 'Scott' asking for the hack to his LG Player for Netflix...YOU CHEAPSKATE! Just pay the $8.95 a month for the Netflix service and be quiet! You should also not ask for illegal advice on a board like this. "To 'Scott' asking for the hack to his LG Player for Netflix...YOU CHEAPSKATE! Just pay the $8.95 a month for the Netflix service and be quiet! You should also not ask for illegal advice on a board like this." HEY MJ YOU ARE MISINFORMED! The LG BD300 includes the Netflix Player (same interface as the Roku NP) as does the Samsung BD-P2500/2550. Therefore Scott's using Netflix on the LG would indicate that he already has a Netflix account and is using the Instant Watch service. Scott's asking for the debug remote submenu is legit. I would be interested in this as well for the Samsung 2500.